The 30 metre motor yacht Vervece is available for event charter in the South of France next Spring at a special rate on €7,000 per day. Charters must be for a minimum of three days and bookings must be made before December 31. Of special note is the fact that she can comfortably accommodate up to 100 guests at the quay side during events like the Monaco Grand Prix or the Cannes Film Festival, making her the perfect host yacht for cocktail parties and receptions. Built as a sturdy tug by the Italian yard Benetti in 1964, Vervece completed a total refit in 2013 at the Palumbo yard in Italy, bringing her up to luxury yacht standards. Under the supervision of the owner, the interior has now a cool, calm ‘beach house’ look in contemporary style. She accomodates eight guests in four cabins with a Pullman for one additional guest, and with three crew cabins. The interior has been brought right up to date and offers extremely comfortable accommodation and communal spaces throughout. According to the Italian yard, Vervece is virtually a new build, with parts of her hull changed and a new superstructure built. The yacht’s engine room was rebuilt and new equipment installed including engines, generators and an air-conditioning system. The original single shaft propeller was replaced with twin props. 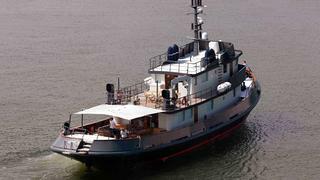 Vervece is now powered by twin 1,000hp (746kW) Cummins engines giving a cruising speed of 12 knots and a range of 3,000 nautical miles at this speed. Vervece charters through Charter & Charter at weekly rates of €34,000 in low season and €49,000 in high season.